The only category of spots our locals do not write about is hotels. From May 2018 we will offer you the possiblity to promote your hotel with a sponsored post on a city blog dedicated to “your” city (we have 73) to our audience of frequent travelers for a fee of Euro 250,=. As two travel addicts frequently frustrated by the obvious, touristy, impersonal, and out-of-date tips they found in their travel guides and on travel websites, Sanne & Bart van Poll launched Spotted by Locals in 2008. 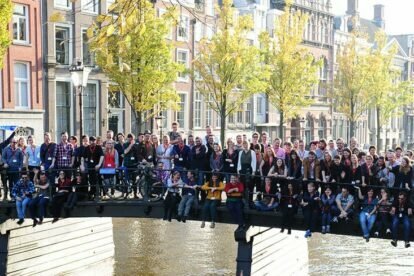 Starting as an experiment blog with insider tips for Amsterdam in 2008, Spotted by Locals is now a series of blogs with up-to-date tips by locals (or “Spotters”) in 73 cities in Europe & North America. Sanne & Bart handpick Spotters and meet all Spotters in person in their city. These lovely locals live in the city they write about, speak the local language, and write about their favorite spots only. In 2012, 2014 and 2016 our community of Spotters met up in real life (read more). What makes us different from other city guides? Our readers are young (mostly 20-40), experienced travelers, earn more than average, and have an extensive knowledge of the internet. They are curious and open – they like to try new things, and stay away from the “obvious”. More than the average internet population our visitors are affluent, highly educated, and have no kids (source: Quantcast analysis). In 2017 we welcomed 1.4 million unique visitors on our blogs. Here’s an overview of traffic per city blog (source: Google Analytics). Why promote your hotel on our city blogs? Your article will appear on a city blog dedicated to the city where your hotel is located. Most of our visitors are doing research for a city trip and often have not booked a hotel yet. Spotted by Locals has been here for more than 10 years. Together with our team of 425 handpicked bloggers we’ve built up one of the best reputations in the travel blogging industry for authentically local tips. Our process is very straightforward. We are very responsive, we know what our audience likes and we love helping you create a great article about your hotel. If you’re not happy with how the article turned out, we will refund you. At least 1 landscape sized image with a minimum of 780 px wide. We recommend 3 images. We will then send you a link for secure payment of €250 via Paypal (you don’t need a Paypal account – you can also pay using a credit or debit card). After payment, you will receive an invoice from Paypal. For questions about Paypal, we refer you to the Paypal support pages. After receiving the payment we will publish your article within 48 hours.Not satisfied with how your article looks? We can always make adjustments! Please contact Bart if you have any specific questions.